It was a gut-wrenching, heart-aching goodbye. As we drove north on I-95, we watched spring disappear, its greens and blooms falling away with each passing mile. And now, on a very cold spring day on Long Island, I am once again looking at a world of brown with only a few patches of green growth — a far cry from South Florida’s lush jungle. So as I re-acclimate to my climate, I am thinking of a post from last year when I gardened in two zones in one week. Please, forgive me for this repost, but I am a sad gardener. Just days ago, I tasted renewal — and this morning, I scraped ice from my windshield. It hurts. It really hurts. One day, you’re on vacation in South Florida, gazing at the pattern of a banana leaf sunlit from behind (above) — and the next, you’re bundled up against the wind chill of Long Island. After arriving home, I went through some random Florida photos and then walked around the yard on Long Island to make a comparison. Can you guess which photos came from which zone? 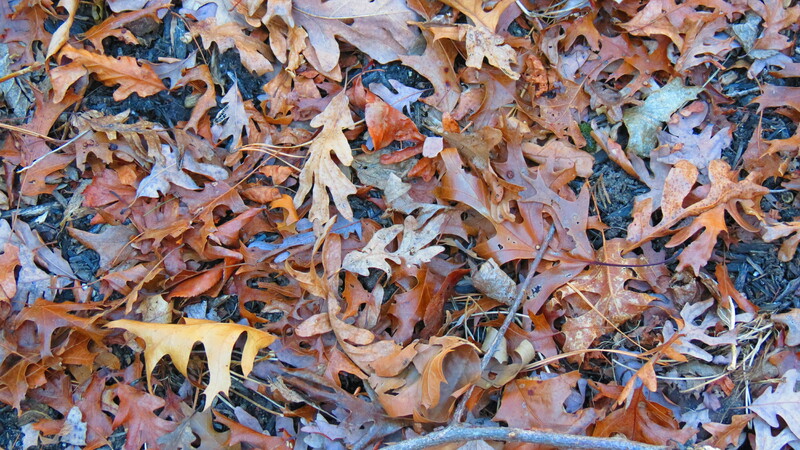 Brown and brittle oak leaves litter the flower beds (above) — and that means weeks and weeks of raking (unless I cheat and hire a lawn service to do the spring clean-up). 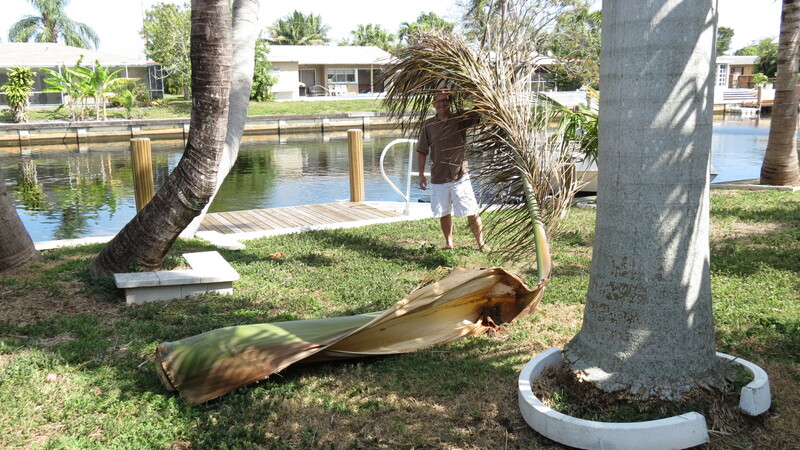 This is a single frond (above) from a Royal Palm. Once the frond has aged and served its purpose for the tree, it breaks away and crashes to the ground — a process which happens each day on palms. They constantly grow and shed — you just don’t want to be standing underneath when it decides to drop. A few cuts, and the frond is manageable and brought to the curb for pick-up. These Hyacinth crowns (above) were not visible prior to getting on the plane. But there they were when we returned. 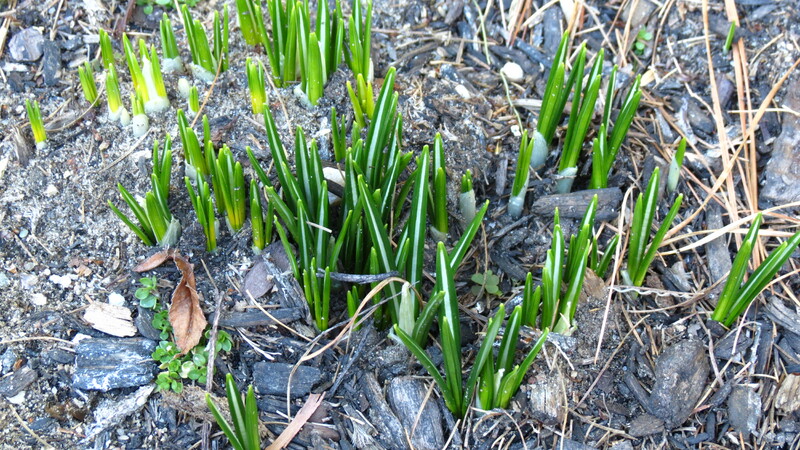 It amazes me that all winter, bulbs are hanging out underground just waiting for some warmth to make their move upward. I can’t wait to smell their flowers. 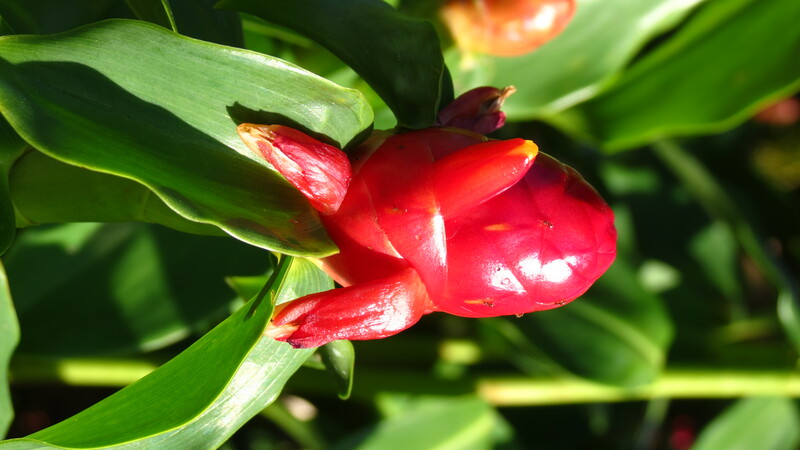 I’m on the fence when it comes to Pine Cone Ginger (above). I love the waxy blooms, but when I see it in the landscape, it looks like it can take over. 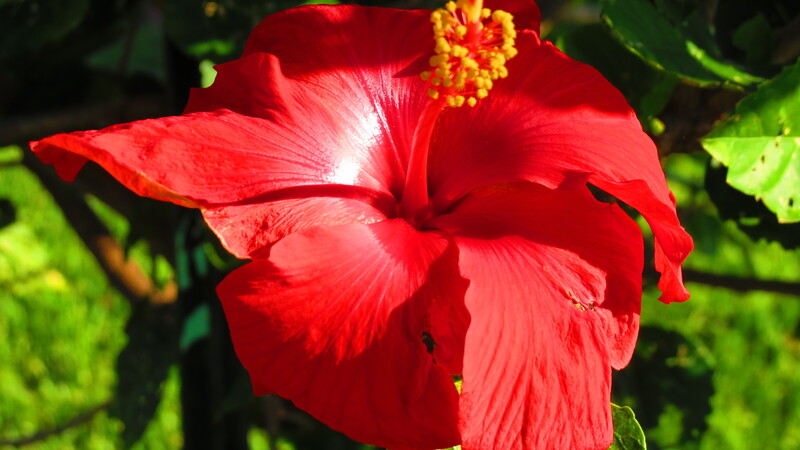 I love red flowers, and this Hibiscus was screaming to be photographed. Far be it from me to ignore the demands of a plant. 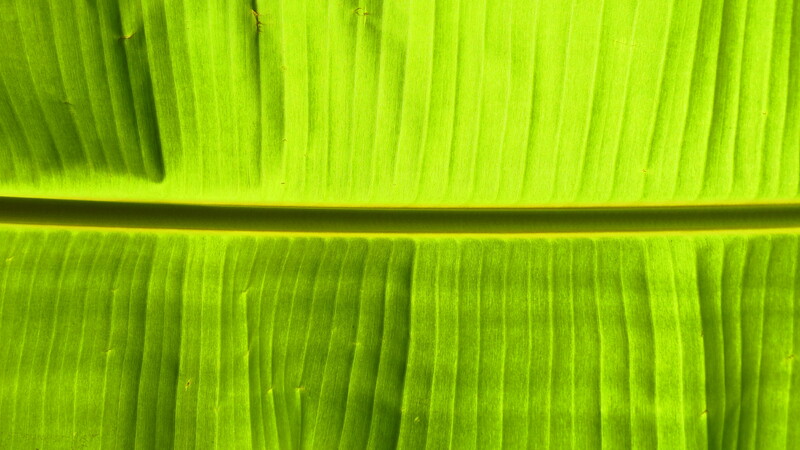 The picture above is the same banana leaf at the top of this post — only I used a color enhancing filter. The result is an acid green with a radioactive glow. Like a vacation, this post has come to an end. And like a finished vacation, it’s time to unpack. You know, unpack the shed, the garage, and the tender bulbs — and get this zone ready to be that zone (if only for a few months). New material is arriving in the next post! Welcome back. Hope your Long Island weather is better than here. 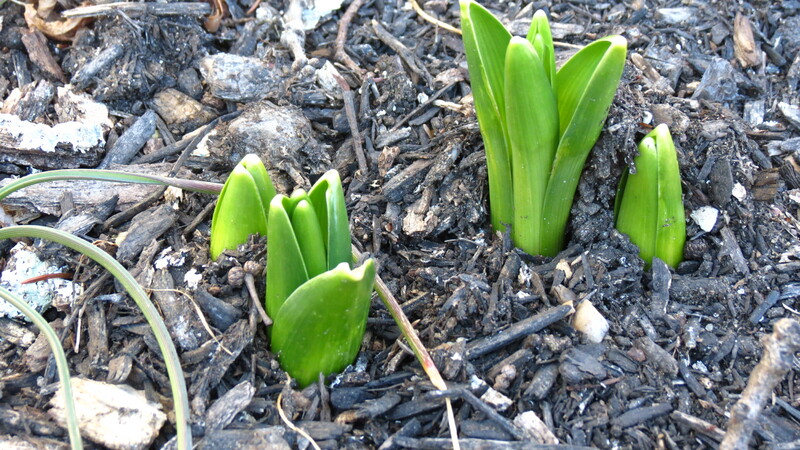 Even with snow the hyacinth are trying to emerge.The banana leaf makes a nice photo. The color is electrifying. Hi there. Fortunately, we do not have snow — but there is a wicked north wind. The hyacinths are emerging, but the flower heads are still nestled deep within the crown. I think they’re a little chilled. Be well! Hi Debra. The forecaster just said tonight will be the coldest night until the fall. I’ll take that pine cone ginger any day. Best of luck with the drought. That’s certainly a challenge for gardening. I really can immagine how you must feel right now !!! It is still very cold here but in a few days we’ll get warmer temperatures but rain, I don’t mind the rain as we need it cos the dry easterly wind has dried out the soil, we live on sandy soil so it dries quickly. Hi Gwennie. We also need rain. We are currently at high risk for brush fires. Here’s hoping you get some warmth and rain. yesterday for the first time in month’s the pond was icefree for about 1/3, but this morning it was frozen again. I hope you get warmth and rain soon too !! take care ! Hi Gwennie. The forecasters are calling for some rain tomorrow, and then windy spring-like weekend. As long as its warm and I can be outside. Enjoy the day! “Just days ago, I tasted renewal — and this morning, I scraped ice from my windshield. It hurts. It really hurts.” – I fully understand! Gardener misery loves gardener company. 🙂 Stay warm! 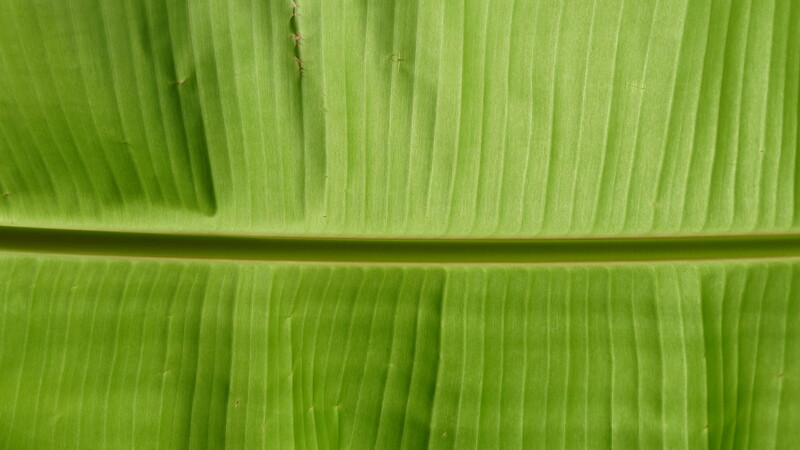 I like the banana leaf and the Hibiscus flower photographs. In India right now it is hot! Good for the plants, all are springing up, but we are withering. Is it ever really cold in India? I’m sure the plants love it, but I am very ready for some heat here. I’m tired of wind chill factors. Thanks for commenting! I really feel what you are saying. For a good two weeks after coming back from our holiday to Mexico I walked around bundled up and feeling cold then one day I woke up and realized it had past and I had obviously reverted back to being used to Michigans cold! Its very hard to leave all that lushness and go back to filling our gardening passions by reading through other gardening blogs from warmer zones with envy! I was late starting seeds etc due to the holiday but my house is now filled with plants growing and encouraging me that Spring is just around the corner! Kevin honey….cold here but plants are starting to poke through, yeah. Happy almost birthday to you!! !